This past Sunday (Oct 19, 2015), Ingersoll Christian Reformed Church celebrated Christian Education during the morning worship service. Students from London Christian Elementary School (LCES), Immanuel Christian School (ICS), London District Christian Seconday School (LDCSS), and Woodstock Christian School (WCS) read scripture, played music and participated in the service. 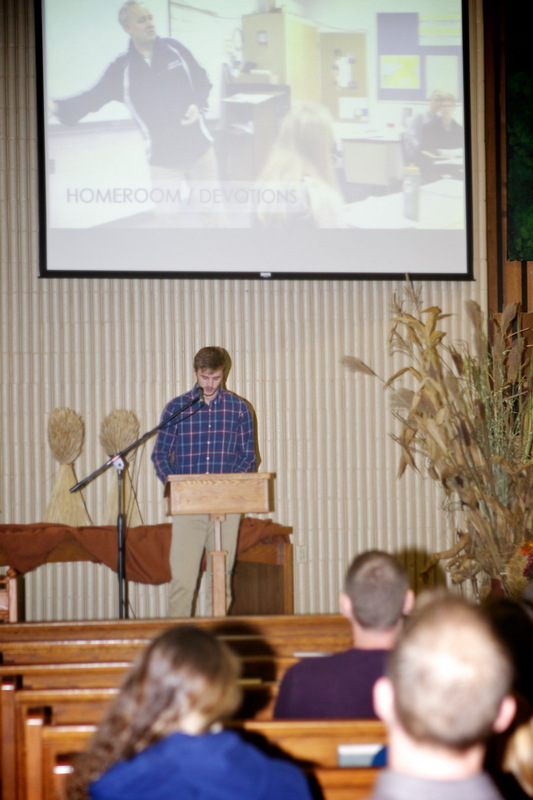 Luke H., a member at Ingersoll CRC, alumni of WCS and current grade 12 student at LDCSS spoke of his experience attending Christian Schools. "Going to Christian school makes you perfect!!! Ahhh…Now I’ve got your attention. No, of course it doesn’t. I wish! Wouldn’t that be nice? Imagine a school with no bullying, no failing, no cheating, no fighting, and no teasing. No, we have all those things at Christian school, but we also have something that other schools don’t and that’s a real foundation in the fact that regardless of all the things I just mentioned, students are taught and experience throughout their entire day for 14 years that God is present, God is in control, God is the reason to learn anything in the first place, and that God is the reason NOT to bully, cheat, fight, or tease. And, yes, I’ve learned leadership skills, responsibility, and good study habits, and all sorts of academic things that you can learn at any school, but what’s different is that students are taught to really appreciate WHERE everything comes from and their spiritual growth is nurtured, not just their head knowledge. When we go on retreats together, we learn to love and respect each other because of who we are in Christ, not just because it’s the law or some post on facebook says to do so. When we visit bogs and study biology, we learn that it’s God’s design and that we should respect it and take care of it because of that reason, not just because it’s the “in” thing to do or a fad to recycle. The idea that everything belongs to God is evident whether we are playing sports, studying math, traveling to Europe, painting, playing an instrument, and, yes, of course, praying. The Bible is quite clear when it commands us to tell or teach our children about God. God promises us that He will be faithful to us if we follow His commandments. He doesn’t say it will be easy or perfect, but He does promise to always be with us and provide for us. The fear of the Lord is the beginning of wisdom. The fear of the Lord is mentioned 144 times in the Bible…I’d say it’s pretty important. In order to develop fear or respect for the Lord, we must understand who He is, so you have to build your learning on a foundation of who God is. All other knowledge is vain and useless. Proverbs 1:7 states The fear of the Lord is the beginning of wisdom, but fools despise wisdom and instruction. My parents, grandparents, and teachers have been faithful and have told me God’s story. I feel blessed to have had the opportunity to not only learn about God’s promises, but to have actually experienced God’s faithfulness and legacy first-hand throughout my daily life for the past 14 years of education. That is the most valuable thing I’ve learned and is the thing that will remain with me forever. I hope, too, that I will be faithful not only to God but to my family before me and pass along this gift to my children as well."